Our E-Z Lock Raised Toilet Seat with Armrests adds 5 inches of height to the toilet seat to assists those with bending or sitting difficulties. The easy-to-use locking mechanism secures the raised toilet seat to the toilet bowl and the smooth contour seat has built-in hand grips for easy handling. This seat fits most toilets, is lightweight, and easy to clean. 17.25" of width between the armrests. 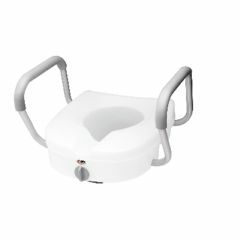 AllegroMedical.com presents The E-Z Lock Raised Toilet Seat W/Armrests. Our E-Z Lock Raised Toilet Seat with Armrests adds 5 inches of height to the toilet seat to assists those with bending or sitting difficulties. The easy-to-use locking mechanism secures the raised toilet seat to the toilet bowl and the smooth contour seat has built-in hand grips for easy handling. This seat fits most toilets, is lightweight, and easy to clean. Adds 5" of height to the toilet seat. 17. 25" of width between the armrests. Comes with padded arm rests. Secure locking mechanism included.